In her new book, award-winning principal and leadership expert Cathie West provides education leaders at all levels with the tools and guidance they need to engage teachers in the process of increasing student achievement. With authentic examples and research highlights, readers learn how to develop a motivated faculty that is truly dedicated to school improvement and student success. Key Concepts provides a bulleted summary of each theme’s major concepts to help readers review key ideas. Best Strategies summarizes each chapter’s high impact teacher engagement strategies. Steps to Success suggests activities that will move new concepts and skills into practice. NOTEWORTHY: This book is also an excellent resource for university and college instructors who are responsible for teacher and principal preparation. The 6 Keys to Teacher Engagement substantially supports graduate level courses pertaining to educational leadership, school improvement, curriculum and assessment, and professional development. Cathie E. West has an MS Degree in education and forty-three years of experience as an educator—thirty-six of these as a school administrator. Professional responsibilities have included serving as a principal; directing special programs, such as Title I, Special Education, and Highly Capable; coordinating curriculum and staff development; and teaching at the college level. Cathie received the Washington Distinguished Principal Award as the representative from Douglas County in 1998, and as the representative from Snohomish County in 2005. She also merited the Leadership for Student Achievement Award from the Washington Association of School Administrators in 2009. In 2010, Mountain Way—the school Cathie led from 2002 to 2013—was designated a School of Distinction by the Center for Educational Effectiveness in collaboration with Phi Delta Kappa (Washington Chapter). Other activities include serving as an editorial advisor for the National Association of Elementary School Principals (2002–05), Washington State Kappan (2007-13), and the Association of Washington School Principals (2011-13). 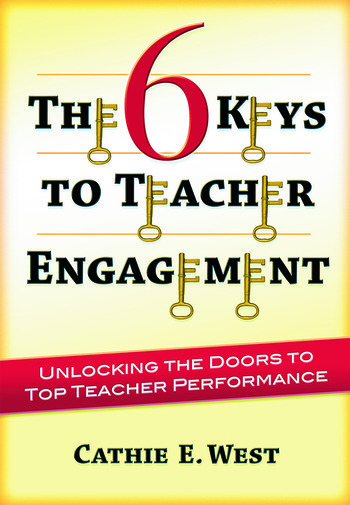 Cathie’s books include The 6 Keys to Teacher Engagement: Unlocking the Doors to Top Teacher Performance (Routledge, 2013); Problem-Solving Tools and Tips for School Leaders (Routledge, 2011); and Leadership Teaming: The Superintendent-Principal Relationship (Corwin Press, 2009) which was co-authored with Dr. Mary Lynne Derrington. Besides books, Cathie’s writing has appeared in The Principal News and Washington Principal (AWSP), Washington State Kappan (PDK), Principal (NAESP), Communicator (NAESP), and ERS Spectrum. She can be reached at: cathieeileenwest@gmail.com.